Nothing is better then a home cooked breakfast to start the day. The reality is though I rarely have the time during the week to make something hot for my family. Several times a week we are forced to turn to a cold cereal in order to get our family fed. Recently I was introduced to a new cereal by by a company we are know. 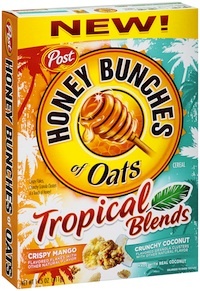 Post Honey Bunches of Oats Tropical Blends combines two complementary flavors that you love to make what can only be described as a party in your mouth. When we received our box of Tropical Blends Crispy Mango and Crunchy Coconut my kids were a little hesitant to try it, like most kids usually are. They really seemed to enjoy the taste of this cereal. I am actually strange and do not eat cereal so they have been my little reviewers this go round. they not only loved it served as a breakfast cereal with nice cold milk but have also began to eat it as a dry snack! It is a great value I found it for $2.98 a box at our local store and we got about 15 servings out of a box. What I love most is it is a cereal that all 3 of my children are excited to eat and like all Honey Bunches of Oats products I am assured it is offering them great nutrition. If you still want to find out more about this and other Honey Bunches of Oats cereals make sure to visit them on Facebook. Make sure to enter below for a chance to win a free box for your family. I've never seen the Tropical. The kids and I love the one with almonds and we just had the one with strawberries. Both Tropical sound yummy. i have never even seen those around but i like the one with almonds in it. I haven't tried this cereal yet, but would love to! I haven't tried it and I don't like cereal, I would give this to my dad if I won it. I haven't tried the new cereal yet,but I do love honey bunches of oats!